The article outlines and discloses lines of experimental work on technologies and materials for inoculation undergoing approbation and intended to be used at OAO AVTOVAZ's Iron Foundry. Spheroidizing ladle inoculation of nodular iron, in-mold inoculation of nodular iron, graphitizing ladle inoculation of flake graphite iron and nodular iron, and secondary graphitizing inoculation of high-strength iron are discussed. Low intensity of casting cooling plays the main role in the heat exchange between casting and sand mold. Therefore, internal metal chills are used to resolve the problem of heat removal and regulating casting cooling. Analysis of results has shown that the strength and yield of castings made with using internal chills are higher than in castings without chills. The article discusses the effect of barium additions on the mechanical properties of AK7ch alloy. It is shown that the barium inoculation allows obtaining enhanced mechanical properties that remain at the same level after corrosion resistance tests. The inoculation effect intensifies by carrying out high temperature overheating (thermotemporal treatment of melt). Over 30 years of investigations into vacuum-film molding (V-process) the specialists at the CNIIMaterialov, and later on OAO CNIIM-Invest, have studied the process parameters and their effect on the quality of steel, iron and nonferrous alloy castings. Specimens of equipment have been designed and manufactured, based on which foundries were created. 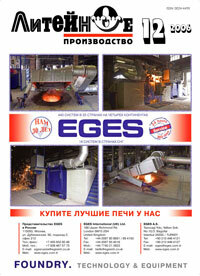 Processes of making castings and ceramic, polymer concrete and gypsum products have been mastered. Available are resources for an end-to-end solution of issues of mastering the vacuum-film molding at foundries in Russia and CIS, from working out design-and-engineering documentation to commissioning equipment adapted to domestic conditions and materials. The article discusses the technology of making jewelry castings using patterns from stuffed natural reptiles. The peculiarities of this technology include the pattern preparation by embalming and the slurry with special properties.